No matter if you lack a huge garden or do not want to spend a lot of money, the 5′ x 5′ Shire Kitty Playhouse offers a fun, but also compact and low priced way for the kids to have some fun in the garden. 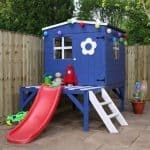 This is one lovely looking playhouse that with its two huge windows has a warm and inviting look which will make it something the kids will love to play inside, but also a structure that you actually like having as part of your garden. 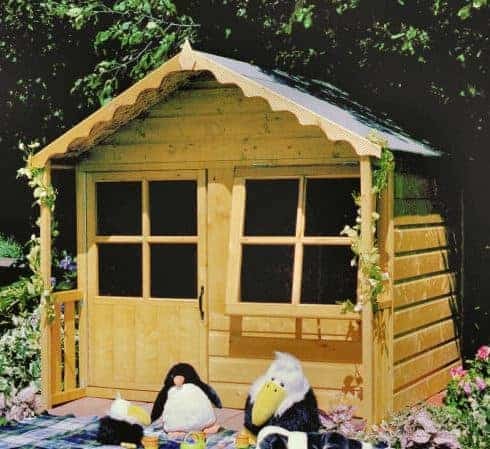 This is a playhouse which manages to offer plenty of room inside for playtime, but at the same time it does not require a lot of space in the garden to be installed. 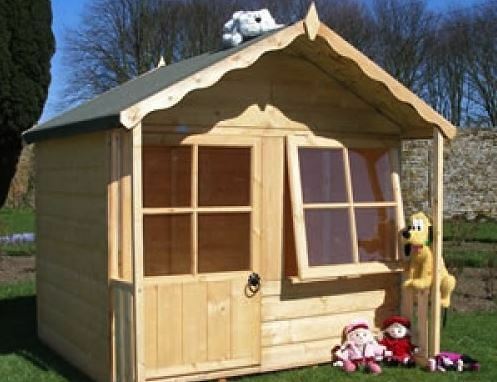 Even though this is one very reasonably priced playhouse this is still made with some of the finest wood you can get and it has also passed all the child safety tests it has been put up against. The apex roof is here to look great and also keep the rain outside. Thick, tongue and groove cladding gives the playhouse a charming appearance, but also does not allow any water to get inside. This is one very high quality and gorgeous playhouse that you can be assured the kids are going to love for many years to come. Let the kids have their own fun space to call home in the garden with this amazing, 5′ x 5′ Shire Kitty Playhouse. 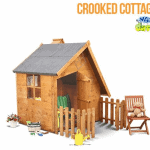 This is a wonderful, compact playhouse that offers a very good amount of space inside for the kids to have a lot of fun with, but it actually does not require a huge garden to be stored in or a large bank balance to be purchased. This is a square design offering the children 4 feet 11 inches in both width and depth. This amount of space will see them be able to store a whole lot of toys or even have a little table and a couple of chairs inside for them to entertain their friends. 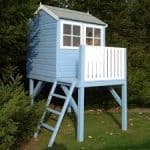 At the highest point the playhouse offers 5 feet 1 inch right along the ridge which we feel is an ideal amount for a child’s playhouse. Even at the eaves there is 3 feet 10 inches of headroom so they will be very comfortable moving around inside of here. We just love the roof that Shire have used here. It has such a lovely and friendly look to it that you cannot help, but smile when you look at it. The roof as well as being a good looking feature of the playhouse is one of the main reasons that no rain will be getting inside here. This is an apex design so you will never have any worries about rain just sitting on top of the roof. The high quality felt that is covering the 11 mm thick roof boards will be able to easily take a good few inches of snow as well. In all this roof manages to be one of the best looking features and also provide a great deal of protection as well. The tongue and groove cladding on the 5′ x 5′ Shire Kitty Playhouse is something that really did impress us. We have had the opportunity to check out a few different Shire playhouses and sheds and they always have fantastic looking cladding and this one right here is no different. The cladding has a very welcoming look to it and we truly believe that tongue and groove cladding is one of the very strongest and most reliable when it comes to keeping things inside safe from the rain. Whilst this is not the most expensive child’s playhouse in the world, Shire have still used some very durable 12 mm thick cladding here which we feel will be able to take many years of rough play from the kids. When we are looking at a product from Shire we always know that the frame is going to be something that is strong and very reliable and that is certainly the case here. This is a very solid, 35 mm x 35 mm frame that is made from some high quality wood to ensure that it stays solid for many years. This frame is up to the task from taking whatever the kids can throw at it. Let’s face it even the most gentle kids like to play a little bit rough from time to time and this frame will be able to take it. The flooring of the 5′ x 5′ Shire Kitty Playhouse is made from 12 mm thick boarding and this boarding we are sure is going to be able to handle a lot of weight and a lot of crazy and wild playtime that the kids will be no doubt having inside here. We are happy with this flooring and have no concerns at all about it not be able to take the weight of a few kids going crazy on top of it. Shire do give the playhouse a basecoat treatment which they say will last you for around three months. But we always suggest that you give your new playhouse a good covering of high quality wood treatment to help the wood stay strong. Coating is something that should be done once per year to make sure the kids can enjoy a rot free playhouse for many years. This is one solid playhouse and Shire will cover it for a whole year. We do not see you having any issues here, but Shire are very reliable when it comes to taking care of problems. Considering this is a playhouse that is fairly compact in its size it did take us by surprise at just how large the door is. The height of the door is 3 feet 9 inches and the width 2 feet 2 inches. This is a bit larger than we would expect on a playhouse of this size, but that is something we really like. It makes getting things in and out much easier for the kids and the door also looks great. The door has a very large window on it and a gorgeous door handle which can be used as a door knocker as well. To go with the large window on the door there is a slightly larger window on the front of the playhouse as well. Both these windows are made from very strong safety styrene to make sure there is never any danger of broken glass. These two big windows let in an incredible amount of natural light and the larger one even opens to let in a bit of fresh air. Because of the style of door handle it would be very tricky to add a padlock to the door. But if you do want to add that little bit extra security, perhaps to keep the playhouse locked up at night then a bolt would not be that hard or expensive to install. Those two large windows on here make it very easy to be able to have a peek inside to see what the kids are up to so this is not a very private playhouse. But adding some curtains or blinds would not be difficult and would perhaps add a little more personality to the playhouse as well. For those of you looking to give the 5′ x 5′ Shire Kitty Playhouse your own little personal touch. We feel that the best way to do this is with some coloured wood treatment. This way you can make this fit into your garden even better and also protect the wood at the same time. One of the best things about this playhouse is how you are not required to buy any extras. You get everything that you need with it which is something we always love to see. We are always very impressed with how Shire are able to use such thick boards for the roof and floor as well as the cladding and still keep the price down. This is high quality all the way, but high quality at a very reasonable price. Kids were clearly in the mind of the person who designed this and that is why these materials have been selected. They will be able to take many years of playtime no matter how often it gets a little bit rough. This is not the largest playhouse you can get, but it still offers plenty of room to play. It should take you and a friend no more than four hours to have this built. Of course if you have the kids there watching you and asking every five minutes if it is built yet then that may add a bit more time to the build and also give you a headache as well. 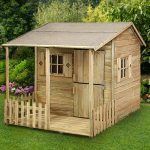 The playhouse is just over £250 and we feel that for the quality it is, you are getting a playhouse that really is excellent value for money. Final Thoughts: We are very impressed with the 5' x 5' Shire Kitty Playhouse. 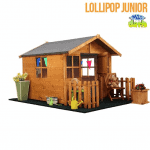 It is a playhouse which has a lovely and just generally charming look to it which we are sure kids will like and adults will also not mind having it as part of their garden. The high quality of materials used here will make it so this is something the children can play inside for a lot of years. We feel that the price considering how long this will last really is quite incredible and would make this a fantastic purchase for anyone looking to give the kids their own little space to enjoy.